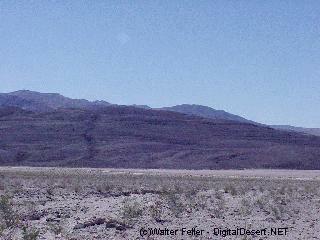 Twenty-thousand years ago this desert scene would have appeared much differently. 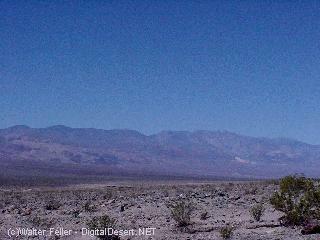 This valley would have been filled with a lake, 90 miles long, 6 to 11 miles wide and up to 600 feet deep. The wind would have blown predominately from the north driving the waves against the dark basaltic lava butte. This would have been the Pleistocene Lake Manly. Lake Manly existed as an indirect effect of glaciation during the Ice Age. As glaciers in the Sierra Nevada began to melt due to climatic changes during this period, water flowed from the mountains and filled the low lying basins. As one basin overflowed into another a chain of lakes across the desert were created. Filling Owens Lake, then spilling over into China Lake, then Searles and Panamint Valleys were filled. Eventually, water crossed the top of Wingate Pass and formed Lake Manly. Some sources indicate that water from Lake Mannix in the Silver Valley also breached the banks at Afton Canyon near Barstow and flowed down to Soda Lake and into the southern end of Lake Manly. 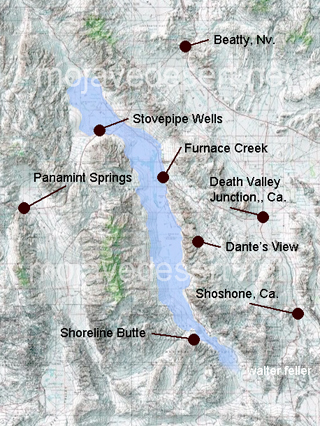 Additionally, some suspect that the lake was at one time connected to the Colorado River system. Lake Manly dried up about 10,000 years ago. Since that time the valley has been dry and subject to seasonal flooding with the exception of a period about 2,000 years ago when a smaller lake about 30 feet deep accumulated, then also dried up. 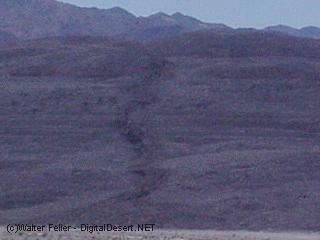 Looking closely at Shoreline Butte, a series of horizontal terraces run roughly parallel across the face. Exposed to the full force of the predominate winds the relentless action of the waves carved these ancient shorelines. The best evidence for the existance of Lake Manly, these terraces also give evidence to the lake's fluctuating water level. Additional evidence of Lake Manly can be found in various points to the north. 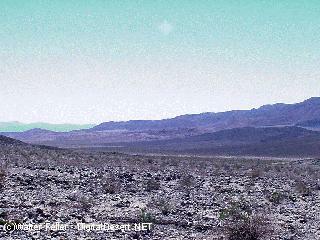 Faint shorelines are visible at Mormon Point, and along the road to Rhyolite, a cut through a gravel bar of water worn pebbles and stones mark the shoreline of this ancient lake may be seen. At least four other episodes of glacial advances have occurred during the last 2 million years. Lake Manly was formed as a result of one of these episodes. Similar lakes may have formed in Death Valley prior to Lake Manly. Lake Manly was named after William Lewis Manly, who with John Rogers walked out of Death Valley in 1850 to get help for the Bennett-Arcane party of Lost 49'ers.